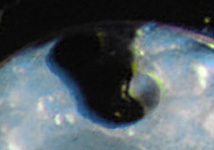 Atlanta inflata is a small species; shell diameter less than about 1.5 mm. 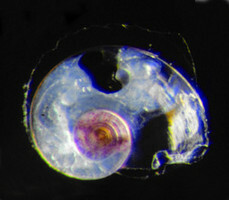 The shell is transparent, although the spire is either brown to reddish-brown or violet to light purple due to the coloration of underlying tissues. The spire sutures are clear, lacking coloration. The keel is tall with a truncate leading edge and has a yellowish-brown to brown base. 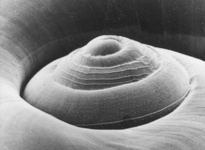 Because of the small maximal shell size, the keel never inserts between the penultimate and last shell whorls. 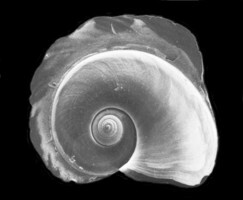 The shell spire is low conical and consists of 4-1/4 to 4-1/2 whorls. 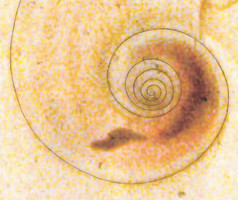 The spire whorls possess spiral ridge sculpture that ranges from weakly to strongly developed. 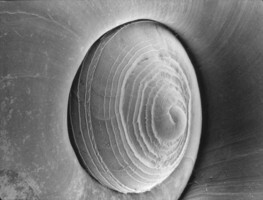 Eyes type a, operculum type c, and radula type I. 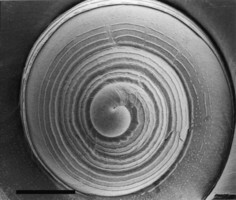 Most of its morphological characters are shared with A. selvagensis, but A. inflata has one fewer spire whorls and has clear spire sutures. Its geographic distribution is limited to the Pacific Ocean in tropical to subtropical waters. Although reported as rare in waters off western Australia and New Guinea, it recorded as abundant in Hawaiian waters. Taxonomy: Recent examination of the historical record preceding the description of Atlanta inflata by Souleyet in 1852 has revealed that priority for this species must be given to J. E. Gray, who latinized the French vernacular name 'Atlante renflée', as published first by Eydoux and Souleyet in 1841 and then by Souleyet in his 1852 Bonite Expedition Report chapter (discussed in Janssen and Seapy, 2009). Since the revision of the genus Atlanta by Tesch (1908), A. inflata has been regarded universally as a cosmopolitan species; found in all three of the major oceans at tropical to subtropical latitudes. The validity of the species in the Atlantic and Indian Oceans, however, was rejected by Janssen and Seapy (2009), who showed that Atlanta selvagensis, described by de Vera and Seapy (2006) from the tropical eastern Atlantic, is in full agreement with specimens previously identified as A. inflata from the Atlantic and Indian Oceans. For further details, see the Atlanta selvagensis page. In his 1852 descriptions of A. inflata and A. helicinoidea (based on specimens collected from the tropical western Pacific Ocean), Souleyet commented on the strong similarities between the two species. 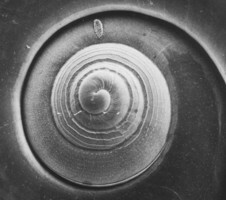 Subsequent authors have also remarked about the similarity of the shells in the two species, which was addressed in a side-by-side comparison of the two by Richter (1987). 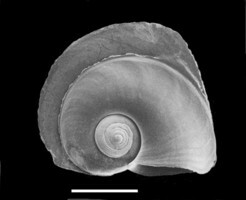 Because both species are small with a nearly identical spire of about 4-1/2 whorls, the shells are very similar. 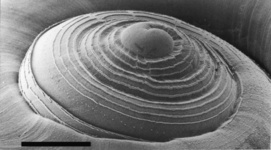 However, the variability in expression of the spiral ridge sculpture in A. inflata (discussed above) contrasts with a lack of variation in A. helicinoidea (see A. helicinoidea page). 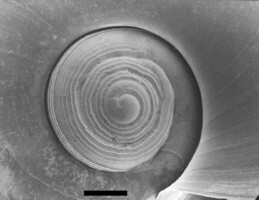 Also, Seapy (1990a) noted that the spiral ridges in Hawaiian A. helicinoidea were thinner and less elevated than in A. inflata, with the result that the spire whorls are more clearly defined in A. helicinoidea. More prominently, the keel is markedly different in the two species; in A. helicinoidea it is low and rounded with a slanting, corrugated texture (see the A. helicinoidea page), while in A. inflata it is tall with a truncate leading edge and the surface is smooth (see title illustration and first SEM above). Lastly, if the soft parts are available for examination, the two species are immediately distinguished by the eyes which are type a in A. inflata and type c in A. helicinoidea. 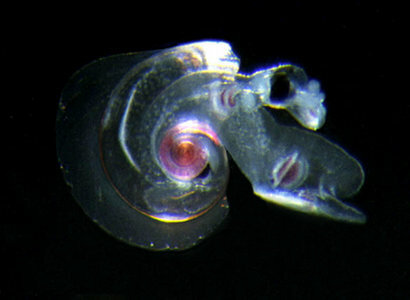 Ecology: Atlanta inflata was found to be abundant in Hawaiian waters (Seapy, 1990a, 2008). It ranked fourth among thirteen atlantid species in the former study, accounting for 14% of the total species counts. In the latter study (Seapy, 1008) it was third among thirteen species during fall and spring sampling periods, accounting for 13.3% and 13.6%, respectively, of total mean nighttime species abundances. Diel vertical distribution of Atlanta inflata was investigated in two studies (Seapy, 1990b and 2008). In the first paper it was recorded from the surface to 145 m during the day and showed a limited migration into the upper 90 m at night, with a maximal mean density of 9.5 individuals per 1,000 m3 in the 45-90 m depth interval during the day. In the 2008 study mean nighttime abundances decreased from oceanic (15 nmi) to neritic (1 nmi) waters by 70% (fall) and 40% (spring), respectively. Evidence for nocturnal vertical migration was weak to nonexistent except at the 5 and 15 nmi stations, but at the 1 nmi station during the spring densities were higher at depths below 30 m during the day and above 30 m at night. Gray, J. E. 1850. Explanation to the plates. In: Gray, M. E., Figures of molluscous animals selected from various authors, etched for the use of students. Vol. 4, 124 pp. Longman, Brown, Green and Longmans, London. Janssen, A. W. and R. R. Seapy. 2009b. 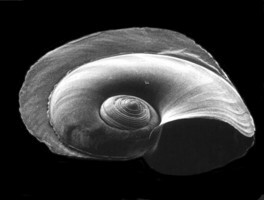 On the identity and distribution of Atlanta inflata Gray, 1850 (Gastropoda, Pterotracheoidea, Atlantidae) in the world's oceans. Basteria 73: 139-157. Richter, G. 1987. Zur Kenntnis der Gattung Atlanta (III), Atlanta inflata, A. helicinoides, A. echinogyra und A. plana (Prosobranchia: Heteropoda). 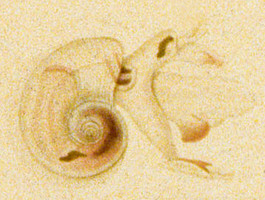 Archiv fur Mollusken-Kunde 117: 177-201. Seapy, R. R. 1990a. 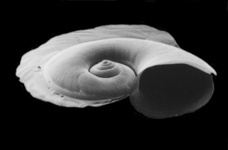 The pelagic family Atlantidae (Gastropoda, Heteropoda) from Hawaiian waters: a faunistic survey. Malacologia 32(1): 107-130. Seapy, R. R. 1990b. Patterns of vertical distribution in eipelagic heteropod molluscs off Hawaii. Marine Ecology Progress Series 60: 235-246. Souleyet, [L. F. A.]. 1852. In: Eydoux, [F.] and Souleyet [L. F. A. ], Voyage autour du monde execute pendant les annees 1836 et 1837 sur la corvette 'La Bonite'... Zoologie, col. 2. 664 pp. A. Bertrand, Paris. Tesch, J. J. 1906. Die Heteropoden der Siboga-Expeditie. Monographie 51, 112 pp. E. J. Brill, Leiden. Page: Tree of Life Atlanta inflata Gray 1850. Atlanta inflata Souleyet 1852. Authored by Roger R. Seapy. The TEXT of this page is licensed under the Creative Commons Attribution License - Version 3.0. Note that images and other media featured on this page are each governed by their own license, and they may or may not be available for reuse. Click on an image or a media link to access the media data window, which provides the relevant licensing information. For the general terms and conditions of ToL material reuse and redistribution, please see the Tree of Life Copyright Policies.